A young blackjack dealer from the South Africa was named the best Africa's dealer. Her name is Nothile Milta she was chosen as the best one on the Tsogo Sun Gaming Competition. 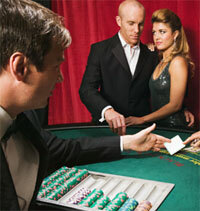 This national competition was testing 13 dealers from 7 different casinos which were situated around the country. The Tsogo Sun Gaming Competition has judged dealers very strictly and individually. The testing was based on the individual experience such as chip handling, accuracy, grooming and customer relations. Moreover, the judges took into their consideration such skills as table attentiveness, versatility and speed were also examined. But there were two areas which were not judged such as bingo lingo and knowledge of the blackjack basic strategy. Nothile Milta a 24 year old girl was working in the gambling industry since 2004. She is very clever, educated and mastered with all tasks during the competition. That is why she deserved the reward. As she says Nothile Milta is very proud of her achievement, but that competition was really nerve-wracking. The judges were very experienced people that knew everything about dealing. Moreover, she added that she had to let her mind work very fast in order to ensure her remained on top of the game." With the help of Tsogo Sun Gaming Competition it is possible to compare the knowledge and skills of every dealer what is very useful for the casino pit bosses.